*Disclaimer: I am not a volcanologist, seismologist or medical professional. The information below is from news sources and my own personal experience living here on the island. If you have medical issues and are concerned about travel to the island, please consult your doctor. You have most likely seen news about new eruptions of our Kilauea volcano. This new volcanic activity is alarming but not surprising. For those planning or looking forward to a trip to the Big Island, I want to make sure you have facts from both experts and someone who lives here on the island. I've seen a disappointing amount of inaccurate reporting, over-exaggerated details and downright irresponsible journalism. Despite the scary videos, images and news reports you may have seen, the Island of Hawaii is open for business. The Big Island is over 4,000 square miles. The area of the latest eruption covers 10 square miles. Travelers should have no worries visiting, according to Jim Bendt, CEO of Pique Travel Design. 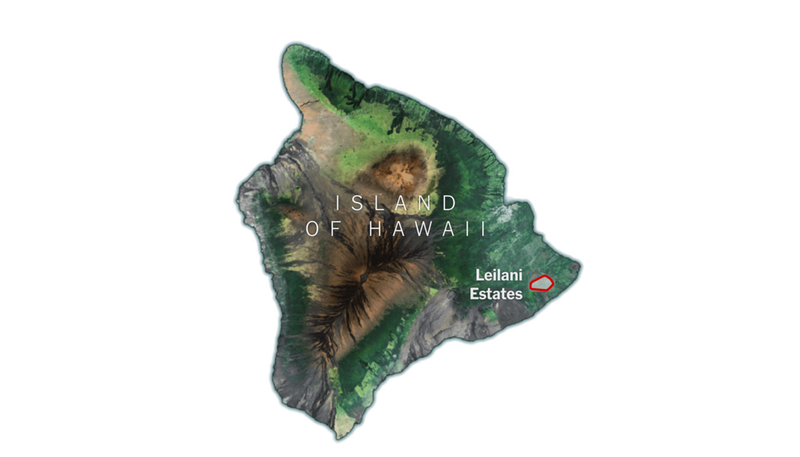 Kilauea volcano has been erupting for over 35 years but in early May, following a series of small tremors, new fissures in the ground began opening in a remote area of the island called Puna and more specifically the neighborhood of Leilani Estates. Puna is located on the slopes of Kilauea volcano. As of this writing, there have been a total of 18 fissures that have opened with new lava flows. All fissures have opened along what is called the East Rift Zone. This new 2018 flow is very similar to a flow that occurred in 1955, which "consisted of 24 separate vents along the East Rift Zone and lasted three months. Nearly 4,000 acres were covered in lava, including main roadways, sugar cane fields and residential neighborhoods." (source) While it is impossible to predict what will happen next, most scientists agree that this new flow could continue on for a few more weeks or months as it did in 1955. Something very important note here is that nothing is "erupting" the way you may have seen in movies or even from your childhood volcano science project. Hawaii lava is known for it's slow-moving, river like flows. Those who live in the affected areas have had enough time to evacuate safely which is why there have been no injuries to persons, only structures which obviously cannot be moved out of the way. If it's so dangerous, why do people live there? It's easy to judge those who chose to live so close to an active volcano. When you live in this part of the island this is a risk you take, right? Absolutely. That is true for those who live anywhere where natural disasters occur often. California earthquakes don't deter people from living there nor do Florida hurricanes. Hawaii is much the same, with an important additional cultural consideration. Living in Hawaii is expensive and for many, land in the area near the new eruptions is the most affordable you can find and it is easy to see why in light of current events. When you want a place to call your own and raise a family, aren't there a few risks you too would take? Native Hawaiians belong here on these islands and want to live here. And why shouldn't they? The mana (power) emanating around Kilauea is felt very strongly as it is the home to Tutu Pele, the Hawaiian goddess of the volcano. But she is more than that to Hawaiians. Pele is the lava. She is the island and she can clean house whenever she pleases. I won't go too far into these beliefs, except to say that as someone who was born and raised in Hawaii but is not native Hawaiian, I both respect and honor Pele same as I respect and love these islands. Whether you or I believe in such deities simply does not matter. It is important to Hawaiians and who are we to judge anyone's beliefs or the reasons they choose to live in a place that though it is dangerous, is still home? Let us be kind and not judge. Is it safe to travel to the island? Government officials, the Hawaii Tourism Authority and USGS scientist have all insisted that it is still absolutely safe to travel to Hawaii Island. Hawaii island is divided into different lava zones, numbered 1-9. The current eruption is occurring in Zone 1. Zone 1 represents areas that are most hazardous and Zone 9 the least hazardous (source). If you look at the lava zone map below, you will see that West Hawaii, Zone 8, is safe from this new lava flow as the lava is flowing away from this area of the island. 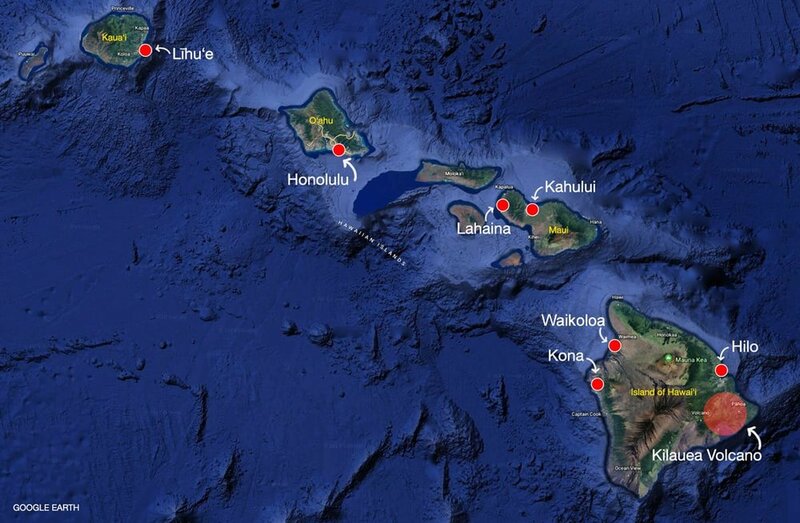 The area with the new eruptions is about 100 miles from both Kailua-Kona town and the Waikoloa/Kohala Coast area. This map is presented courtesy of Atlas of Hawai'i, 3rd edition, Honolulu: University of Hawai'i Press. Image Source: Clark Realty. Unless you were planning to stay in Puna or any town south of Puna, your trip should be mostly unaffected. Hilo is open for business. Pahoa is open for business. Kona town and Waikoloa are certainly open for business. According to an air pollution specialist, what you should do is check to see what the air quality looks like where they are planning to go (source). Is Volcano National Park open? Right now it is closed for the safety of the employees and visitors due to the unpredictable nature of all this new activity. No one lives in the immediate area of the summit crater so the closure was done out of an abundance of caution to the public and Park employees. Park hours are being updated daily so in a week or two it may reopen to the public again. If your trip is affected in any way it will be that you may not be able to visit the Volcano National Park. Out of respect to those affected and to allow emergency management officials to do their job, the state is asking that you do not attempt to visit the area of the new lava flows. In Waikoloa, the blowing trade winds mean clear blue skies by day and the most beautiful view of the starry sky at night. On days where trade winds aren't blowing as strong, there is definitely some vog (volcanic fog) in the air. Depending on how thick the vog is, it can look like a soft haze over the sky. On the worst day in Waikoloa (the day after the first fissure opened) there was a heavy amount of vog in the air. To me, heavy vog days feel a lot like allergies - runny nose and a scratchy throat. Again, please consult your doctor if you have any respiratory issues and are concerned. If you are concerned about air quality, I would recommend moving your accommodations to Waikoloa, the Kohala Coast or Waimea where the affects have thus far been very low. This is 100% your choice to do so though the Hawaii Tourism Authority insisted there are "no reasons at this time for travelers to change or alter their leisure or business plans." Both airports are open and operating normally. There have already been an increase of reported cancellations and this news has been devastating to most on the island. Tourism is the largest single source of income for Hawaii’s economy (source). It keeps the islands running and many small businesses won't be able to continue on if our normally busy summer season simply does not happen. The island needs your business now more than ever. If you are interested in reading more, here are a few articles that go into detail about the current flow. Additionally, there is linked source information throughout my post above. I'd be remiss not to mention those who have been evacuated and who have lost their homes. This is heartbreaking no matter how you look at it. To lose your home is a devastating, life altering event and my heart is with those in Puna dealing directly with this tragedy. I simply cannot imagine their pain. And while I've worked hard in this post to make it clear that 95% of the island is safe and okay, I don't want to minimize the suffering of those who are hurting. BBB-verified campaigns to support those affected by Hawai‘i Island’s Kīlauea eruption. Donations may also be made directly to the American Red Cross Hawaii Chapter by clicking here or calling (808) 739-8109. The Food Basket is accepting donations of water, food, supplies and money for the people in Puna affected by the recent volcanic activity.